The Suspender Factory of San Francisco Inc. has been making unique and high-quality work, novelty and dress suspenders in a variety of colors and patterns for more than twenty years. We take pride in being the best among leading manufacturers and online retailers. We are a company with big ideas and the ability to make them happen, whether you are a wholesaler who needs 10,000 suspenders or an individual who is looking for that special pair. 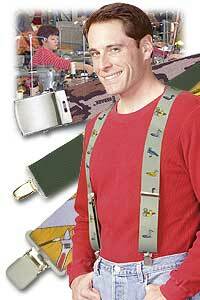 We're hung up on suspenders, have been since the 1970s. Since then, we have expanded into an international operation, but our commitment to quality remains the same. Today, we make suspenders for: power attorneys, performance artists, carpenters, doctors, dentists, for hip-hoppers, handy men, and for you. Our suspenders stretch back to the days of disco and roller derby. Our clients have included Hank Williams Jr .and King Gustav of Sweden. We have custom designs for major corporations like Sears, Anheuser-Busch Brewers, John Deere and Harley Davidson. We invite you to select from our hundreds of designs at our online store. Accessorize yourself or someone you love. To give you such outstanding quality, value, service, and guarantee that we may be worthy of your high esteem. ©2004 The Suspender Factory of San Francisco, Inc.
All rights reserved. No duplication of images, text or any content of this site without written consent.